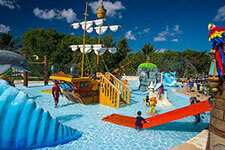 Discover high-seas adventure at Buccaneer's Bay, the colorful family area at Playa Mia. Kids will have a blast pretending to sail on our pirate ship, shooting water cannons, and playing in the sunshine like a modern-day pirate. Kids are free to be kids - and pirates! - at Buccaneer's Bay. Designed just for children and their families, this unique area ignites the imagination and provides endless hours of fun. 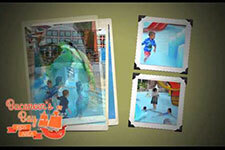 With small-sized water slides, waterfall features, and water-blasting cannons, it's a wet, wild way to spend the day having fun. The centerpiece of Buccaneer's Bay is our miniature pirate ship, complete with crow's nest, cannons, and sails hosted and ready. But you'll never walk the plank on this ship - there's a slide instead, so mini pirates can disembark at will. Surrounding the pirate ship is a collection of colorful play characters: a friendly sea turtle, jumping dolphin, purple octopus, and cheeky parrot. A bright green palm tree rains down a refreshing cascade of water. Kids will find plenty of play spaces to dream, splash, and have the time of their lives. Buccaneer's Bay is just one of the twenty attractions and activities that are included in your admission to Playa Mia Grand Beach and Water Park. Spend a day with us playing in the sunshine, and discover why we're one of the top things to do in Cozumel for families. Want to know more? Please contact us for more information and to purchase tickets. Make plans for an island adventure today!